No!!!! My poor tomatoes...what's happening??? The top one looks like tomato fruitworm=corn earworm damage, but could also be from a big hornworm. You would usually see leaf damage from the hornworm. both would leave black droppings in the area. teh second picture looks like catfacing, but could also be a scar from a fruitworm that got to the fruit when it was still little. Do a careful search of the plant and you should be able to find the critters. Another possibility is a rodent. The top two do look like hornworm damage to me. 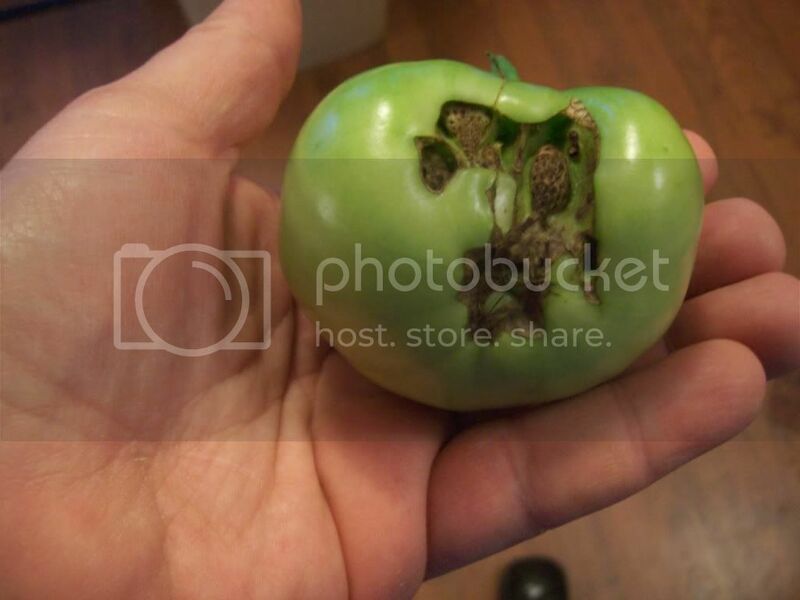 Sometimes if you cut the damaged tomato open, the worm will still be inside. Otherwise do check your plants very carefully. For such a big critter (relative to the insect world), hornworms are remarkably hard to spot, being the precise shade of green of the plant they are on. leave them alone. They have already been parasitized by braconid wasps. The cocoons will hatch out into more little wasps to patrol your garden. Every hornworm I saw in my garden last year had already been parasitized, so they are very efficient. Where are you located? There is another post with photos of similar gnawed damage in which rodent - rats - predation was suggested. If that's the case, they probably come at night. Maybe putting out some traps will reveal them or I've read suggestion of creating a flour (that's ground grain) patch to see if they leave tracks. If the tomatoes are already blushed and starting to change color, you could pick them and bring inside to ripen. Another possibility may be to get large tulle gift pouches and bag the fruits or use birdnetting to completely wrap entire plants, tying the bottom to the stem. That very well may be the case. We have lots of little rodents running around the mountain here...mice and stuff. Though it's interesting to see these eaten like this up high, when there are easier targets below. Is there no taste loss from picking them early? The flavor might be different ripend off the plant because of the different conditions, but it won't necessarily be worse. I can't taste a counter top ripended fruit and identify it as such. 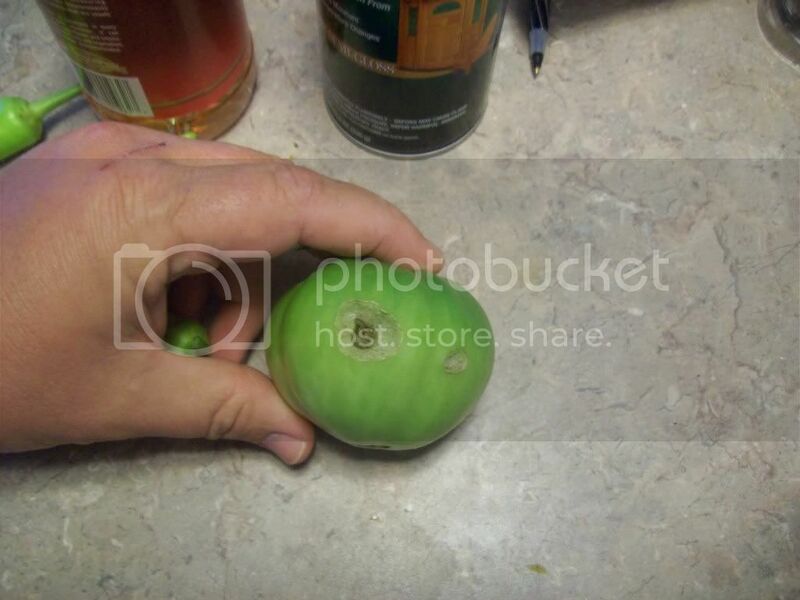 Whats happening to my tomatoes? 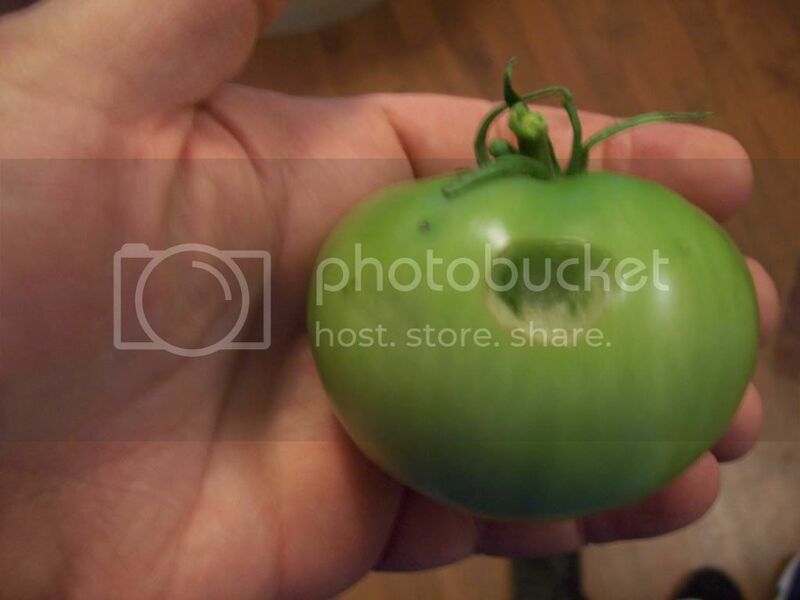 Tomato N00b - what's happening to the leaves? ?